Thinking about building a 2nd Unit? This meeting is for you! 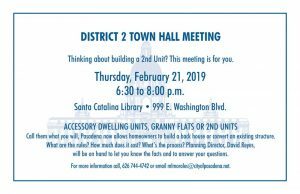 Accessory Dwelling Units, Granny Flats or 2nd Units. Call them what you will, Pasadena now allows homeowners to build a back house or convert an existing structure. What are the rules? What does it cost? What is the process? Planning Director, David Reyes will be on hand to let you know the facts and to answer your questions.